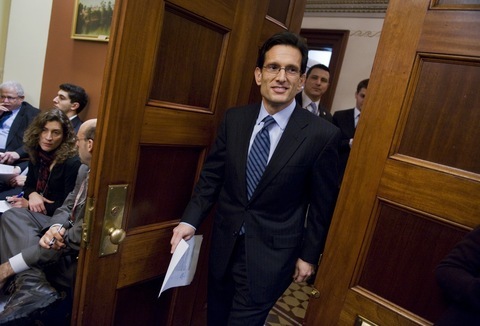 House Majority Leader Eric Cantor, R-Va. Photo by Tom Williams/Roll Call. In the aftermath of the 2012 campaign, which saw President Obama re-elected by a wide electoral margin and Democrats add to their numbers on Capitol Hill, there has been a fair amount said and written about the Republican Party’s soul searching. On Tuesday, House Majority Leader Eric Cantor, R-Va., hopes to present a way forward out of the political darkness in a speech at the American Enterprise Institute in Washington titled “Making Life Work,” which will offer a more cheerful vision for how government can improve the lives of the American people. “Government policy should aim to strike a balance between what is needed to advance the next generation, what we can afford, what is a federal responsibility and what is necessary to ensure our children are safe, healthy and able to reach their dreams,” Cantor plans to say, according to prepared remarks released by his office. The second ranking House Republican has looked to expand his influence in recent months, especially on debt and deficit issues, voting against the fiscal cliff agreement that passed in early January. The move put him at odds with House Speaker John Boehner, R-Ohio, who was trying to wrangle the GOP conference to back the measure. He and his colleagues must do a better job of explaining to the public “why we are for the things that we’re for,” Cantor said. The agenda Cantor will put forward Tuesday is expected to include fixing the education system, simplifying the tax code, reducing health care costs and reforming the country’s immigration system. The National Journal’s Ron Fournier reports that Cantor’s attempt to soften the GOP’s image also included a visit Monday to a private school in Washington, D.C.
Partisan Democrats love to call Republicans bullies, belittling GOP policies as cruel and heartless. Left unanswered, demagoguery sticks — which is the point of Cantor’s charm offensive. The question for Cantor and other Republican lawmakers is whether they will be able to make inroads with voters that supported President Obama and congressional Democrats just by tweaking their messaging, or if it will also have to be accompanied by a broader shift in strategy — at least on some issues. A confidential Justice Department memo outlines the Obama administration’s legal reasoning used to determine whether it may employ drone strikes against U.S. citizens suspected of working with al-Qaida. Scoop is by Michael Isikoff of NBC News. Senate Minority Leader Mitch McConnell, R-Ky., has refused to rule out a GOP filibuster of defense secretary nominee Chuck Hagel. But Sen. John McCain, R-Ariz., one of Hagel’s chief critics on the Armed Services Committee, and other leading Republican senators said they would oppose the use of the filibuster to block the nomination. McCain told reporters Monday he did not believe it was appropriate but didn’t say how he would vote. Sen. Bob Menendez, D-N.J., spoke with CNN’s Dana Bash amid accusations that he dallied with prostitutes in the Dominican Republic and waited too long to reimburse a wealthy donor for flights to the Caribbean nation. “The bottom line is all those smears are absolutely false,” he said. Politico’s David Nather reports that Ohio GOP Gov. John Kasich rankled conservatives Monday with his decision to expand Medicaid in the Buckeye State with federal dollars. The Sunlight Foundation finds that three political groups bought ads to air in the Washington, D.C., metro area during the Super Bowl. Samantha Power, a longtime foreign policy adviser to Mr. Obama, is reportedly leaving the administration in the coming weeks. The Department of Energy’s online network was hacked in mid-January, according to Reuters, but the hackers didn’t breach any classified information. The Washington Post’s Karen Tumulty writes that Homeland Security Secretary Janet Napolitano is “quietly making it known” that she may run for president in 2016. Your Sen. Romney hopes have dimmed. Tagg, the eldest Romney son, says he’s out in the Massachusetts race. Republicans have yet to find a candidate to run for the open seat, vacated by now-Secretary of State John Kerry and to be temporarily held by Mo Cowan. Former Massachusetts GOP Gov. Bill Weld also announced Monday that he would not run. Former GOP Sen. Scott Brown and former GOP State Sen. Richard Tisei have also passed on launching bids. Fox News is “monitoring the situation” of Geraldo Rivera’s possible run for the New Jersey Senate seat currently held by Democrat Frank Lautenberg. Lautenberg raised just more than $11,000 in the fourth quarter of 2012. The veteran New Jersey Democrat has previously self-funded his re-election efforts, including a $1 million loan in 2006. Roll Call reports that Sen. Mark Begich, D-Alaska, raised more than $300,000 for his 2014 re-election bid in the fourth quarter of 2012. The Twitter account belonging to Rep. Raul Labrador, R-Idaho, tweeted, then deleted, a post on Sunday that read: “Me likey Broke Girls.” The comment, apparently in reference to the CBS sitcom “2 Broke Girls,” seems to be the work of the congressman’s spokesman. Buzzfeed ranks the most interesting things on Speaker Boehner’s desk. No. 5: a tiny desert garden in a snifter glass. Tuesday’s tidbit from NewsHour partner Face the Facts USA counts the totals on unpaid federal taxes. Joe and Sally are two fictional sexagenarian puzzle-solvers in love. Read here how they read the fine print on social security and plotted to kill for maximum benefits. This short story is by Larry Kotlikoff for Paul Solman’s Making Sense page. Sheldon Adelson has upended the Israeli newspaper world with the influential conservative daily he started in 2007. NewsHour’s PJ Tobia reports on the paper. This day 1858, 50 members House of Reps brawled when SC pro-slavery man tried choke PA abolitionist, stopped when MS Congman’s wig torn off. Re: Iran space tweet – lighten up folks, can’t everyone take a joke?